Calit2 Virtual Reality Design Engineer Greg Dawe demonstrates the HUVR device, which combines a consumer 3D HDTV panel, a half-silvered mirror and a touch-feedback controller that allows users to literally ‘touch’ a generated image as if it was a tangible three-dimensional object. 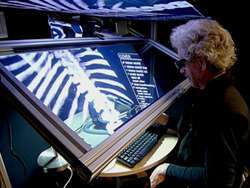 The Heads-Up Virtual Reality device (or HUVR, pronounced ‘hover’) couples a consumer 3D HDTV panel with a half-silvered mirror to project any graphic image onto the user’s hands and/or into the space surrounding them. With his or her head position tracked to generate the correct perspective view, the user maneuvers a touch-feedback (haptic) device to interact with the generated image, literally ‘touching’ the image’s angles and contours as if it was a tangible three-dimensional object. HUVR is ideal for tasks that require hand-eye coordination and is well-suited to training and education in structural and mechanical engineering, archaeology and medicine. The device could be used, for example, to visualize and manipulate a 3-D image of a person’s brain taken from an MRI, or an artifact too fragile or precious to be physically handled. A re-engineering of work done by Bell Labs’ Ken Knowlton more than 30 years ago (as well as later systems made by many researchers with 21” cathode ray tube monitors), HUVR also evolved from PARIS, a system created 12 years ago by DeFanti, Dawe and their colleagues and students at the Electronic Visualization Laboratory, University of Illinois, Chicago. 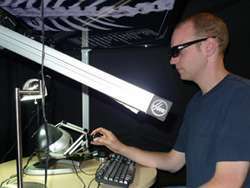 Calit2 VIsualization Specialist Andrew Prudhomme manipulates HUVR's force-feedback controller. A less expensive, re-engineered version of 30-year-old technology, HUVR could be used to visualize and manipulate a 3-D image of a person’s brain taken from an MRI, or an artifact too fragile or precious to be physically handled. The recent availability of 55” active stereo panel TVs was the key to making HUVR, which is essentially a more lightweight, portable, and - at about $7,000 (without head tracking) - a much cheaper version of the PARIS-based technology. Constructed from a $2300 Samsung 3DTV panel available at most retail electronics stores, HUVR also offers better brightness, contrast, and visual acuity than PARIS, all of which increase user satisfaction. Although passive stereo 3D HDTVs have been available for about a year - allowing DeFanti and Dawe to build a new VR device called NexCave - active stereo is needed for HUVR. Active stereo generates separate left- and right-eye images that can bounce off mirrors and are separated into left- and right-eye views by the user’s active eyewear, which blink in synchrony with the 3D HDTV’s 120Hz images. The polarization used in passive stereo will not stay polarized when reflected off a mirror, hence the need for active stereo in HUVR and its precedents.